Written in four sizes and four gauges to fit most anyone (see notes below for more). This was supposed to be a pompom. No really, stick with me here! 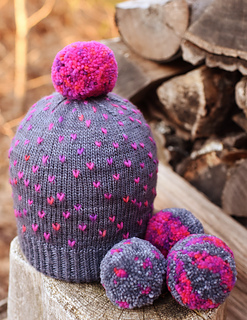 I was looking for an excuse to finally sit down and write out all the stuff I want folks to know about pompoms (how to get them super full and round, how to make them detachable, how to incorporate stripes or polkadots, what tools I use to make mine). 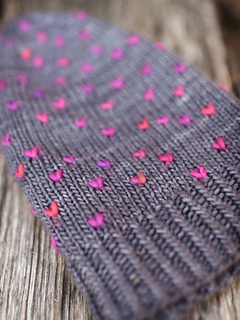 And I had just about talked myself into putting it all into a pattern and calling it a day. But it turns out you’re not allowed to have a pattern for just a pompom all by itself! So my first thought was ‘no problem, I’ll just do a totally plain hat to go along with it, then I’ll be following the rules and still get to play with the pompoms.’ But then…well…then that seemed boring. So I decided this would be the perfect time to explore adding random speckles to my knitting (sort of like thrums, but without the bulk that usually has). 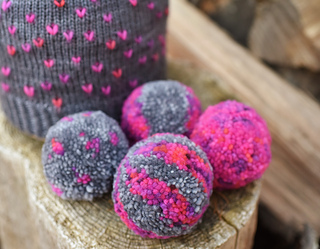 Because if we’re going discuss the finer points of pompoms, we’ve already decided we’re comfortable with the whimsical, why not bring speckles in too? Now here we are! 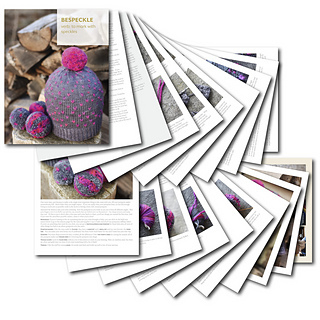 The pattern is alarmingly detailed (ten pages of step-by-step photos and information on pompoms, four pages of step-by-step photos and information on how to create and place speckles), so I’m pretty sure you’ll walk away feeling like you learned something new. It is written to work at several different gauges (4.5, 5, 5.5, and 6 stitches per inch) and sizes (fits heads between 18.5 and 23.5 inches, with lots of points in between, which should work for everything from little kids to large adults), because I suspect you may find yourself knitting more than one, and I want it to be easy to find the yarn that tickles your fancy (the speckles are seriously the perfect thing to do with even your tiniest bits from the scrap bin). And I suspect you’re going to have a ridiculously good time! 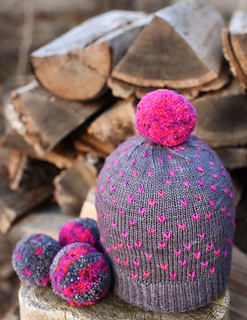 Oh, and just to help you plan, I used about 140 yards of the main yarn (gray) and about 15 yards of the speckle yarn (pink) to make a hat for a large adult with occasional speckles. If you’re making a bigger or taller hat, you might want more like 175 yards of the main color and 20 of the speckle color. 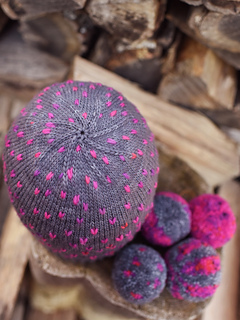 My pompoms are made on a 55 mm maker, and each one took about 60 yards of yarn (they are little yarn beasts, but that’s what makes them so cute). 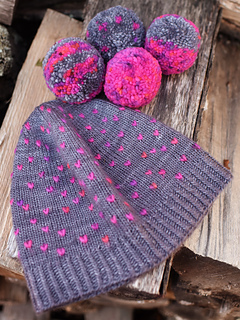 I used one skein of the pink and one skein of the gray to knit the hat and make all four pompoms (and I had a little bit of the pink left, but not enough to make another whole pompom).